The membership of Freemasonry, by and large, is made up of average men. Its ranks include laborers, clerks, merchants, tradesmen, lawyers, enlisted and commissioned members of the armed forces, doctors, statesmen, farmers, salesmen… the whole spectrum. Andrew Jackson: Grand master of the Grand Lodge of Tennessee, Jackson was the first of two presidents to have so served Freemasonry. Jackson was the first U.S. President born in North Carolina. James K. Polk: Known to have served as junior warden of his lodge, there is no record of Polk ever serving as master. During his presidency, he assisted in laying the cornerstone of the Smithsonian Institution with Masonic ceremonies. Polk was the second North Carolina-born President of the United States. James Buchanan: Master of his lodge in 1823, Buchanan also served as a district deputy grand master in Pennsylvania. He delivered the address at the Masonic dedication of the statue of Washington, Washington Circle, Washington, DC. He was buried with Masonic honors. Andrew Johnson: During his presidency, Johnson participated in five Masonic cornerstone ceremonies… in Chicago, Baltimore, Boston, Antietam (MD), and Washington. He was buried with Masonic honors. He was Abraham Lincoln's vice president and took office upon Lincoln's assasination. Johnson was also born in North Carolina. William McKinley: Our twenty-fifth president was prompted to seek Masonic membership when he observed the fraternal kindnesses being exchanged among Masons in the Union and Confederate Armies during the Civil War. William H. Taft: Taft was another of the presidents that took part in various Masonic activities while in office. On one occasion, he posed for a picture while wearing Washington's Masonic regalia at the White House. Warren G. Harding: Becoming a Mason only three years before his death, Harding nevertheless became very active Masonically and joined a number of the appendant orders. Gerald R. Ford: President Ford was a member of Malta Lodge in Michigan. 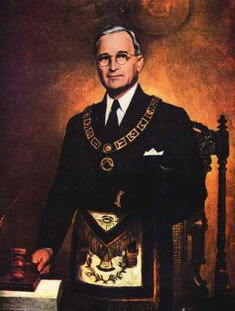 There have been many other famous Americans that were Masons, and these have included Benjamin Franklin, David Bushnell, George Walton, Haym Salomon, John Hancock, Joseph Hewes, John Marshall, Paul Revere, Duke Ellington, Red Skelton, W. E. B. Dubois, Douglas MacArthur, Thurgood Marshall, and many, many more. Numerous Masons are members of the United States Senate and Congress, while others hold important commands in the armed forces. Several state governors are Masons. It should also be noted that over 40 North Carolina Governors were also members of the Masonic Lodge.